Melbourne University Athletics Club has started the summer season well with good performances in Round 1 of AV Shield. The 2009/10 Track and Field season opened on Saturday the 10th of October with Round 1 at Aberfeldie. A sunny Saturday afternoon saw the return of competitive athletics for the summer and a good team effort from MUAC. Lauren Jauncey won the Women’s Long Jump with a leap of 5:40m. Frank Ciancio started his season well with a 5000m win in 16:11, only 20 seconds outside his PB. Paul Kennedy, the evergreen walking aficionado, won the 3000m walk in 14:39. The Women’s 4 x 400m team of Lauren Jauncey, Emma Zalcman, Kath Clarke and Kath Sutton easily won the relay to gather double points for MUAC. Jordan Mayston was the first points scoring athlete in the 800m, running 2:00.96. MUAC fielded full teams in 6 of the 10 events for both Women’s and Men’s Division 1, a good sign for upcoming rounds and progress to the finals. The club had 14 men and 12 women out at Aberfeldie to kick the season off and make sure that the dim sims from the canteen were as tasty as they were last year. 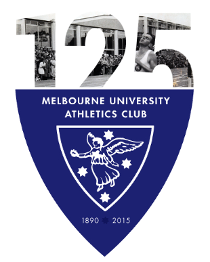 MUAC will be competing this Saturday, 17th October at Newport Athletics Track, Williamstown.